A bust of Richard Stockton is no longer on display in the library of the university that bears his name in Atlantic County due to his slaveholding past. The statue of the signer of the Declaration of Independence will return, along with a display addressing his ownership of slaves. 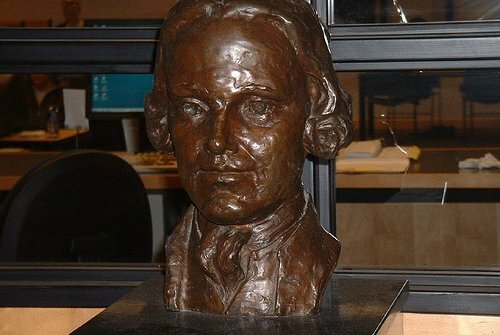 A bust of Richard Stockton, a slave-owning signer of the Declaration of Independence from which Stockton University takes its name, has been removed from the school's library. Stockton University President Harvey Kesselman told The Press of Atlantic City Thursday that controversy about the college’s namesake has been going on for years before the recent cultural tug-of-war over Civil War statuary. The statue will eventually return, but with a contextual history exhibit. “It never was placed in context, and I think that’s the most important thing about this,” Kesselman added. The bust came down Wednesday. The university's provost, Lori Vermeulen, sent a letter to the campus community Thursday explaining the removal. Kesselman told The Press the timing is relevant due to protests in Charlottesville, Virginia, and elsewhere around the country. He said he expects some backlash, but the university wants to have a transparent conversation about the decision. To read the entire Press of Atlantic City story, click here.